Traitor Bradley Manning Allowed to Change Name to "Chelsea"
Private First Class Bradley Manning stole 251,000 State Department documents, many of them secret international embassy reports. Manning smuggled the security documents out on a CD labeled “Lady Gaga.” Manning was bitter after a breakup with his boyfriend. Manning, smuggled the information out of a secure facility on a CD. Never before had a superpower lost control of such vast amounts of sensitive information. 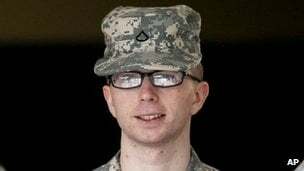 A Kansas judge granted a request Wednesday to formally change the name of the soldier convicted of leaking classified documents to WikiLeaks from Bradley Edward Manning to Chelsea Elizabeth Manning. The former intelligence analyst is serving a 35-year prison sentence for passing classified U.S. government information to the anti-secrecy website WikiLeaks. Manning is serving the sentence at the Army prison on Fort Leavenworth in Kansas. “Hopefully today’s name change, while so meaningful to me personally, can also raise awareness of the fact that we (transgender) people exist everywhere in America today, and that we have must jump through hurdles every day just for being who we are,” Manning said. 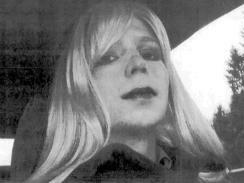 The decision clears the way for official changes to Manning’s military records, but it would not compel the military to treat Manning as a woman. That includes transferring Manning to a prison with a woman’s unit.